GBS stimulates exfoliation and disrupts vaginal epithelial cell barrier function in vitro. (A) hVECs were infected with WT GBS for 0, 16, or 24 hours and stained with 10% crystal violet for 30 minutes. Loosely adherent cells were removed by centrifugation, and crystal violet staining intensity was measured. Data were normalized to mock-infected controls (n = 3; **P < 0.005 and P = 0.08, by ANOVA followed by Sidak’s multiple comparisons test; data represent the mean ± SEM). (B) hVECs were infected with WT GBS for 24 hours and analyzed by scanning electron microscopy. Images show hVEC detachment 24 hours after infection with control PBS (mock) or WT GBS. Scale bars: 10 μm. (C) The barrier function of hVEC monolayers was monitored in real time using ECIS. 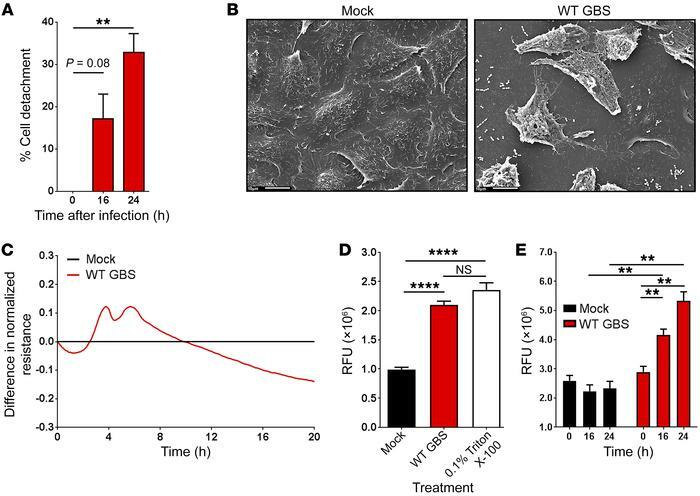 Infection with WT GBS led to a disruption in barrier function as determined by the decrease in resistance of the infected monolayers compared with the uninfected control (n = 3; data represent the mean). (D) hVECs grown on Transwells were infected with WT GBS for 24 hours or treated with 0.1% Triton X-100, which was used as a positive control. After 24 hours, fluorescein dye was added to the apical compartment of the Transwell, and migration of the dye to the basal compartment was measured after 1 hour (n = 3; ****P < 0.00005, by ANOVA followed by Sidak’s multiple comparisons test; data represent the mean ± SEM). (E) hVECs grown on Transwells were either mock infected or infected with WT GBS for 24 hours. At 0, 16, and 24 hours after infection, the basal compartment of each well was sampled and stained with SYTO9 nucleic acid to enumerate bacteria (n = 3; **P < 0.005, by ANOVA followed by Sidak’s multiple comparisons test; data represent the mean ± SEM). RFU, relative fluorescence units.